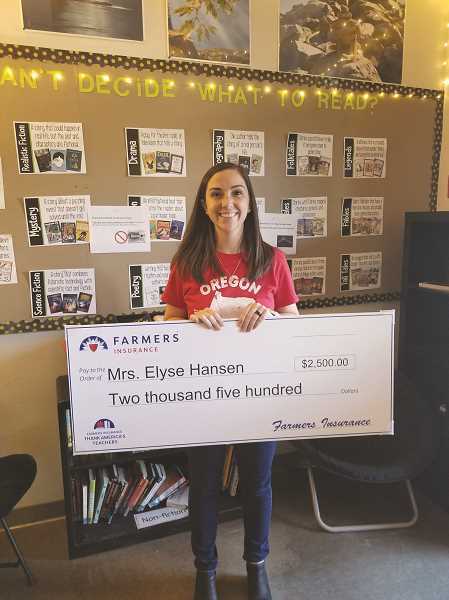 Elyse Hansen, an eighth-grade humanities teacher at North Marion Middle School, has been awarded a $2,500 classroom grant from Farmer's Insurance Company. The process required that she receive nominations daily and be one of recipients of the most votes. She networked throughout the community and made her mission a collective one for the school, the district and the entire community. Hansen said she will be using the money to invest in a variety of strategies to increase her students' literacy. That means using a large part of the grant to build her classroom library and also to hold a schoolwide event with literacy-themed activities. "I'm wanting to use the money to purchase more books for my classroom," Hansen told the Canby Herald, the Independent's sister publication, when voting was still open in October. "I really want to create a love of reading with my kids, and one of the best ways to do that is to get more books. Books are expensive. A hardbound book is usually $15-20 a piece. I want to get books that I know kids are going to be interested in, that are culturally relevant and newer. So, that means buying them. By creating that love of reading, kids will be readers for life." Hansen is so dedicated to providing quality reading materials for her students that she has dipped into her personal budget to make it happen. "This year, I've already bought about 10 books just because kids love this author, so I'll go buy five more of her books because the kids want to read them," Hansen said. "I could really use the money to do that, instead of having to personally buy my books." The grant is from the Farmers Insurance's Thank America's Teachers program. Through the program, Farmers awards 180 teachers with the $2,500 grants and five with $100,000 educational grants, totaling nearly $1 million in grants. In her five years at Farmers, this is the first time Canby agent Christina Gutierrez has met a teacher who has taken advantage of the grant program. "The cool thing about it is it is a nationwide grant (opportunity)," Gutierrez told the Herald. "So, I think it's neat out of everyone in the United States, Elyse went ahead and went for it." In addition to students voting daily, when Gutierrez visited the school to advocate for Hansen, she encountered students encouraging their parents to vote too. "I was over at her parent-teacher conferences. I set up a table for her and was talking to people," Gutierrez said. "And it was the students who came by, saying, 'Oh mom, this is my teacher. You have to vote. She's great." Students aren't the only ones who think Hansen's work is remarkable. "This process was a terrific opportunity to showcase the care and commitment of one individual that galvanized the collective effort of the community," Principal David Sheldon wrote in an email. "We are very proud of her intense effort and believe she deserved to be one of chosen winners of the grant. ... Mrs. Hansen is an incredible human being with a heart for education and her students."